Florida Southern’s men’s basketball sees their season come to a close in Fort Lauderdale, Florida, as Lynn defeated them in the NCAA South Region Semifinals, 88-78. The Mocs (25-8) struggled in the opening minutes as Lynn (25-6) took a 9-0 lead before Brett Hanson was able to get Southern on the board (2-9) with 16:41 left in the first half. The Mocs were able to narrow the lead to four on the next possession (5-9) before the Fighting Knights extended their lead to 12 points (13-25) with 9:47 left in the half. Southern attempted to tie the game before halftime, but was only able to narrow the difference to six as time expired (35-41). The first half momentum carried through the break for the Mocs as the opened on an 8-0 run to take the lead (43-41) with 16:35 left to play. Jack Rauch extended the lead to three on the next play (46-43) but that was it as the Fighting Knights went on their own 8-0 run to take the lead and hold it for the remainder of the game. The Mocs made multiple attempts to regain the lead but could not move closer than five (58-63) as Lynn eventually pulled away with the 10 point win. 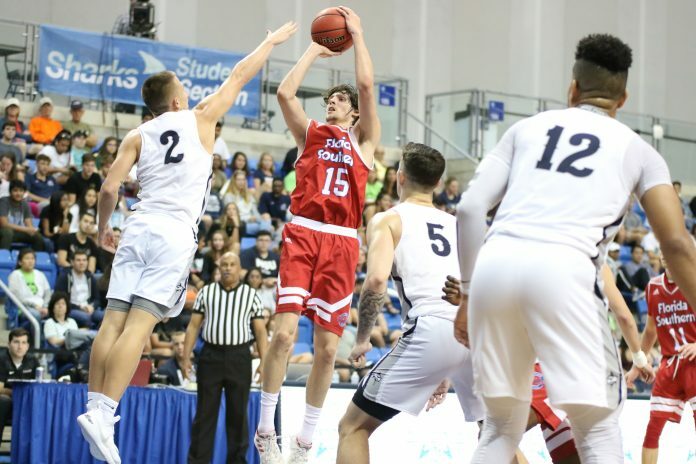 Florida Southern finished with 44.1 percent from the floor and seven three-pointers, but Lynn’s 52.5 percent from the floor, nine three-pointers and the 38-31 out rebounding of the Mocs proved to be the difference in the game. Southern moves to 43-32 all-time in NCAA Tournament play and 11-3 in the Regional Semifinal game. The men finish their 2018-2019 campaign as the Sunshine State Conference (SSC) tournament champions for the 24th year and finished with 25+ wins for the 16th season. SSC Player of the Year Jonathon Lawton finishes his two years at Southern with 1,428 points while averaging 22.3 points per game. Ben Marello finishes his two years at Florida Southern with 588 points while averaging 9.5 points per game. Slinky Jones finishes his two years with the Mocs with 675 points, shooting 10.4 points per game while rebounding 6.2 times per game.